Preserve America Executive Order (E.O. 13287) signed by President Bush on March 3, 2003, affirms the Federal government's leadership role in protecting historic properties. Among the goals of Preserve America are to promote partnerships for the use and rehabilitation of historic properties, and to assist in developing heritage tourism opportunities. As a steward of cultural resources that belong to the American public, the Bureau of Reclamation (Reclamation) encourages and invites you to learn more about them. Your interest and concerns are valuable to our cultural resources program. You can tour several of Reclamation's most significant historic engineering works. For information on visiting historic and cultural sites at Reclamation facilities, see www.recreation.gov. Unfortunately, since September 11, 2001, many of Reclamation’s dams and power plants have restricted access due to security concerns, however, historical information about many is available online through a partnership with the National Park Service. Other Reclamation historic buildings and structures that are open to the public offer a glimpse into the past. The original Folsom Powerhouse in Folsom, California, is part of the Folsom Powerhouse National Historic Landmark and is now managed by California State Parks. The original Reclamation administration building for the Elephant Butte Irrigation Project has been rehabilitated as a bed and breakfast. Reclamation maintains a number of visitor centers and museums at its project facilities that tell the story of their construction. For example, a visitor center at Hoover Dam in Nevada contains many static and interactive exhibits on the history and construction of Hoover Dam and Lake Mead. 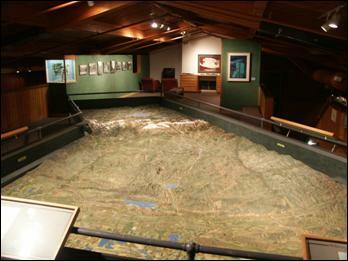 The visitor center at Flaming Gorge Dam in Wyoming has models and displays of the dam and reservoir. Reclamation partnered with the Owyhee Irrigation District in Idaho to develop exhibits at the historic construction office below Owyhee Dam. Interpretation focuses upon construction of the dam and the associated irrigation developments. For more information on visitor centers and museums at Reclamation facilities, see www.recreation.gov. 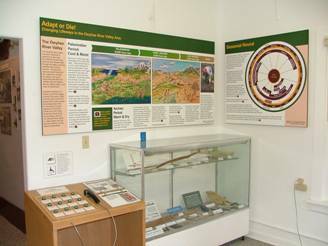 Elsewhere, interpretive displays provide historical information to visitors. At Buffalo Bill Dam in Park County, Wyoming, a needle valve, ball valve, and a cableway winch once used at the dam are on display in the parking lot west of the dam. A self-guided tour of the historic Shoshone Irrigation Project begins 1.5 miles west of Buffalo Bill Dam and ends at Deaver Reservoir in Park County, Wyoming. Ten wayside exhibits explain the history and significance of the irrigation project. At Pathfinder Dam in Wyoming, an interpretive trail begins at the Interpretive Center (located in the historic dam tender's house) and includes stops at Pathfinder Dam and Dike, Pathfinder Suspension Bridge, and the Engineer's Camp. 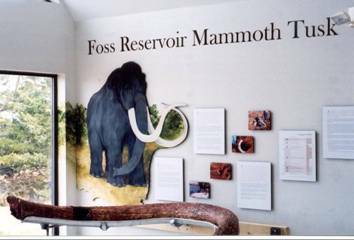 At Reclamation’s Foss Reservoir Interpretive Center in northwest Oklahoma, a mammoth tusk is on display that weighs over 200 pounds and measures 8 feet 10 inches long. It is estimated to be around 20,000 years old. The tusk was exposed along the shoreline of Foss Reservoir in 2001 and excavated by a crew from Wichita State University under an agreement with Reclamation. After being professionally restored, the tusk was installed at the visitor’s center as part of an exhibit describing the mammoth, its habitat, and efforts to restore the tusk. At Clark Canyon Reservoir in Montana, the main historic attractions are interpretive plaques along a short walking tour that examine the Lewis and Clark Expedition. Reclamation constructed a kiosk and parking area at Tiber Reservoir in Montana for interpretive plaques provided by the local Lewis and Clark Trail Committee. At Belle Fourche Reservoir in South Dakota, aside from viewing the historically significant dam, visitors can learn about the former Civilian Conservation Camp and World War II Prisoner of War Camp that was located there. A kiosk in historic Walcott Park, across from Minidoka Dam, provides information about the area's history and construction of Minidoka Dam. Both the park and the dam have historic significance; the latter is listed in the National Register of Historic Places. At Owyhee Dam in Oregon, the Owyhee Irrigation District operates a visitor information center located in the historic construction office below the dam. The historic building that serves as the Visitor Center at the Owyhee Dam has an exhibit about the area’s prehistoric residents. The small exhibit, entitled Adapt or Die! Changing Lifeways in the Owyhee River Valley, explains the way that people throughout history and prehistory in eastern Oregon had to adjust to dramatic climate changes. Along with warming temperatures and reduced moisture, plant and animal populations shifted steadily over the last 12,000 years. A successful adaptation called the ‘seasonal round’ was developed, in which small family groups traveled extensively across the landscape to different locations where certain plants and animals were in season. The exhibit emphasizes that while this way of life is no longer practiced to a great extent, modern-day members of Northern Paiute tribes – the descendants of the Archaic inhabitants – still routinely travel to certain areas to collect traditional foods. Two large wall displays tell the bulk of the story, including two riveting illustrations of life at three different periods in prehistory, a modern photograph of a Burns Paiute woman digging roots, and a striking graphical representation of the seasonal round. A flipbook contains additional related information in a tactile form. An exhibit case contains reproduction artifacts that range from an atlatl and dart to a tule duck decoy. There is also an audio description with twelve narratives activated by push-buttons that provides an alternative way for visually impaired visitors to experience the exhibit. The exhibit was produced by the Pacific Northwest Region of Reclamation for the benefit of the Owyhee Irrigation District, and much of it was accomplished in-house. In Yakima, Washington, Reclamation cooperated with the Yakima Valley Museum to develop a permanent exhibit highlighting the role of "the ditchrider" in ensuring the successful delivery of irrigation water to farmers. The ditchrider theme is integrated into a larger exhibit at the museum, which explores where Yakima Valley settlers came from and why they stayed. The ditchrider component provides compelling personal stories that lie behind the complex engineering that brings irrigation water to the valley, and contributes to the economical success of the community. Reclamation participates in a variety of outreach activities to encourage public involvement in cultural resources protection. Reclamation has partnered with several State Historic Preservation Offices to protect archaeological sites through their Site Steward Programs. Volunteers monitor the condition of sensitive archaeological sites. If you are interested in learning more about Site Steward Programs, contact your State Historic Preservation Office. If you are interested in learning about other possible volunteer activities, contact the cultural resources staff in your area. As a member of the public, you have opportunities to express your concerns about the impact of Reclamation's activities on cultural resources. Your views are important to our program. As part of Reclamation's responsibilities under Section 106 of the National Historic Preservation Act of 1966, as amended, and its implementing regulations (36CFR Part 800), we are required to seek and consider public input when proposing activities that may have an effect on cultural resources. This process is often integrated with public participation requirements under the National Environmental Policy Act. For more information on proposed Reclamation activities, contact your closest Reclamation cultural resources staff person.